1)The device has a tidy construction, has a high speed, has a stable and reliable performance, and its operation are easy to master. 2)The running of this device is controlled by the mico-computer controller. 3)It is equipped with the OMRON photoelectric tracing system of high precision. 4)The place sealed and cut by it is very precise and the temperature of the seals are controlled seperately and it is adopt for many kinds of packaging materials the seal looks fair and is firm. 5)With the continuous adjusting of speed by frequency conversion, no interval will occur in the changes. 6)Has realized the full automatic processing of the following procedures, which are: Material folding, moulding; Cut of; Feeding; Medicine liquid(disinfector) spraying and packaging. 7)It has a full automatic circular system combining the function of the display of the medicine liquid content, spraying, medicine liquid flow control, and the collecting. 8)The flow of the medicine liquid can be adjusted by manual freely. 9)When the code printer is equipped, the producing date serial number can be printed automatically. Looking for ideal Wet Tissue Packing Machinery Manufacturer & supplier ? We have a wide selection at great prices to help you get creative. All the Horizontal Flow Wrapping Machine are quality guaranteed. 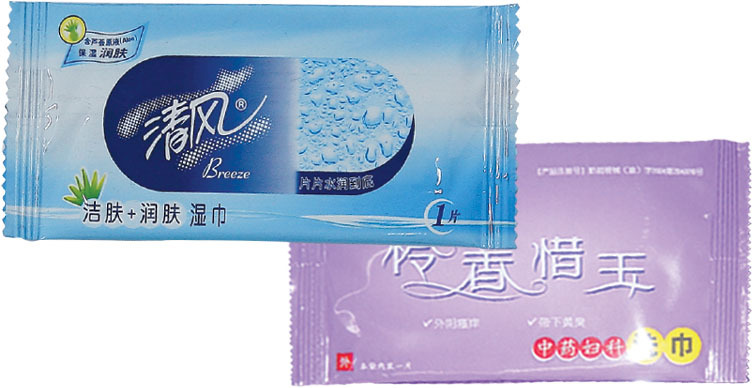 We are China Origin Factory of Automatic Napkin Packing Machine. If you have any question, please feel free to contact us.